Before we start - a great big thank you to those of you who donated this week... especially since my paypal coding keeps messing up. But, thank you for being patient with me as i worked it out, and for letting me know in the first place that the coding wasn't working. You're so sweet, and i appreciate it so much! Hello everyone! Thanks for all your emails and well wishes this week. Artoo is doing much better. His cold grew into a nasty cough, which brought on several sleepless nights. We had to reschedule a medical procedure that he was booked for, he was coughing too much. Chewie and i had fun this week making Potato stamps and finger painting, I didn't take any pictures of the process because i was up to my wrists in paint. but it was fun. I really enjoy when Artoo has his nap, and Chewie and i get some much needed 1 on 1 time. Things are slowly starting to feel like they're back to normal for me. YES - I'm still sick, after 2 weeks. But I took myself to the doctor this weekend. While sitting in the waiting rooms i tangled away in my Tangle A Day calendar. What a great way to pass the time. For those of you who are new here, the first Monday of every month is a UMT challenge, or Use My Tangle, where the challenge is to try out one of YOUR tangles. If you'd like to submit a tangle click this link for submission guidelines. this week's challenge is brought to you by Margaret Bremner, a fellow CZT and Saskatonian. You can see the step outs for her tangle DANSK here on her blog. 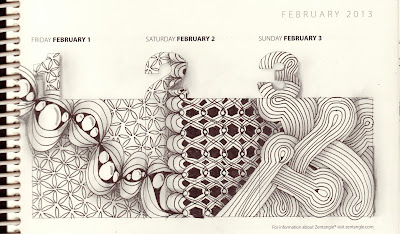 You can see i used this tangle in my TAD Calendar i shared earlier (February 3rd!). I'm giving away a Tangle A Day Calendar, courtesy of the amazing and wonderful Carole Ohl, CZT. To enter, leave a comment saying you'd like a calendar! For an extra entry, share this giveaway on your blog. For my fans on FACEBOOK - i'm also giving away a Tangle a Day Calendar! To enter, you must Like The Diva's Weekly Zentangle page. For an extra entry, share the giveaway on your wall! (This giveaway will be live on Facebook by noon today. Contest will end this saturday at midnight! Good luck! i can't add it from work - so it will be up later tonight. thanks for understanding. Please enter my name in the Calendar give-away. That would be totally cool. I am so sorry about your sinus/infection. I get EXACTLY the same thing. My allergist has me using a plastic spray bottle (instead of a netti pot). I now have 3 of them...one for travel and one for my winter address and one for summer. I do this DAILY like brushing my teeth. I do think it helps prevent infections! Get better quick! Oh yes!! I would like to enter my name in de Calendar Give away. I also did share the Giveaway on my blog. I'd like to enter my name in the Calendar give-away, too! I'm glad to hear that you're getting better. I hope the meds will do the rest now so that you'll have your full strength back soon. I'd like to enter for the calendar giveaway. :) I hope you feel better soon! I get things like this quite often. In addition to the saline rinses, I also have a small face humidifier thing. It feels nice and helps to open things up. I'll be posting the giveaway on my blog later too. I posted on my Blog, liked your FB page, and shared on my FB wall. I really really really want to win. :-) hehe Is Mr. Linky hiding? Please enter me in for the calendar. Thank you so much for these challenges. Oh yes! I would like a caledar! Please send one to holland! Hope you get all better soon. Take care! Thank you for having the Calendar-a-Day Give-away. Thanks to Carole Ohl too. Please enter my name in this Give-Away. I'd love to have this calendar! Thanks to you and Carole for having this give-away. i would love a calendar. I am tangling daily an am addicted. recently did a fish. Going to start your weekly challange. Add me to the list of tanglers who would like to win the calendar! Hope you'll be all well soon. Greedy as always :-) I like you to enter my name for the Give-away. I also mentioned it on my blog. I think it's quite generous from you, to do this. So, if I win or not, thank you! I tried to donate something, but it gives a errror all the time. Sorry to read that you're not better yet. Take care! Laura, thank you again for your willingness to give us a challenge. Thanks Margaret for your sweet pattern. I hope that your day goes okay Laura, I know how much harder everything is when you don't feel well. I will watch for the linky. I would love a calendar. Your calendar page is amazing! I want to thank you for having this great blog and giving all a chance to share. it really is great to see and git great info. here. and I would love to have a Tangle a Day Calendar! Hi Laure, please feel better soon, what a trooper you are, the calendar give-a-way is a great idea. Please enter me in. Amazing tangles at the Doc's...!! And many thanks to Carol Ohl. I would also like to win the TAD calendar. Hope you feel better soon! I would love to have a Tangle a Day Calendar! I will post this on my blog as well when I get around to doing the challenge and posting. Hope you are feeling better soon. I also would love to get a calendar.... and I will share the giveaway on my blog too! .. Thanks for the weekly challenges! Glad to hear you are feeling a bit better, hopefully full recovery doesn't take as long as end of Feb. I'd love a calendar, too! Please enter me in the calendar draw, would love one! Hope you are soon feeling better. I think your tangle page is totally awesome! A mega inspiration. Please enter me into the calendar draw. Yummie! I've been wanting this book for two years now. Get well soon, darlin'. Sharing on my blog....NOW! 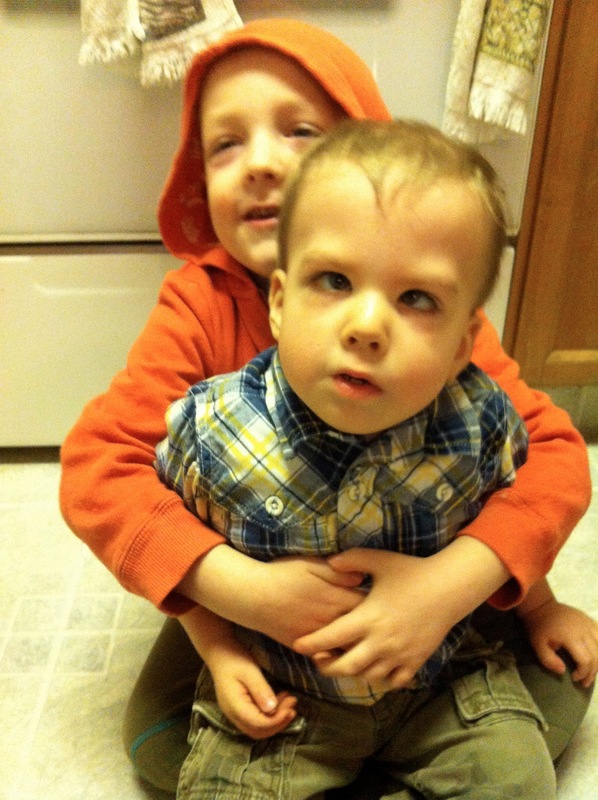 I am so very glad that you are on the mend and the kids toooooo... great going. Thanks for all the input even when you are not feeling so good.. that takes a super human person... but you knew that anyway... right??? A calendar would be awesome! Thanks for sharing... glad you are all on the mend! Please enter me for a chance to win a calendar! I shared the giveaway on my blog! http://atangleintime.blogspot.com/2013/02/carrying-on-happy-mail-and-diva-giveaway.html Thanks Laura and Carole!! 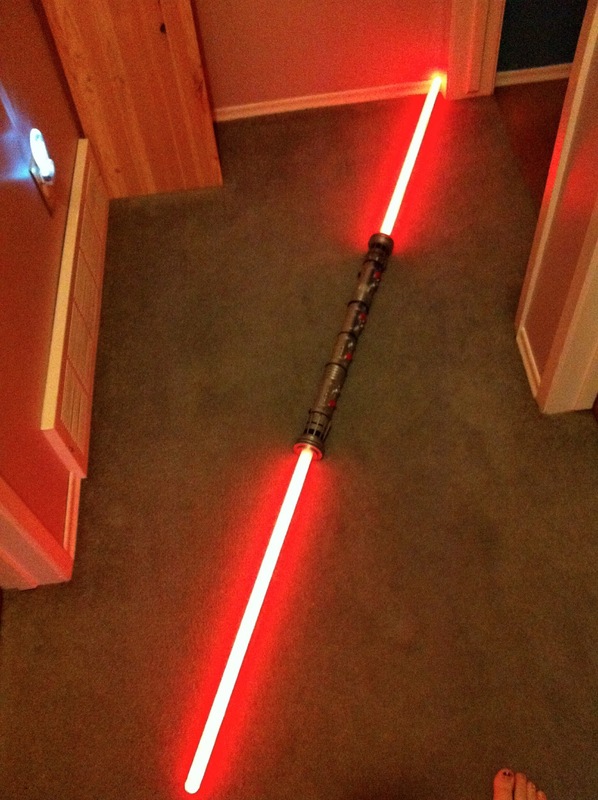 Hi, I am new here. I want a calendar and am going to try my first challenge! Very excited to be participating. I did share it on my blog (http://emilyhoutz.blogspot.com/2013/02/check-this-out.html) and I shared the FB page. This is going to be FUN! Thanks for giving away one of Carole's calendars - I would definitely love to win one. Sorry about your sinuses. Instead of the Neti Pot, I've had more luck with their Sinus Rinse Bottle - same idea but it seems to work better for me. Hope you're feeling batter soon! Hope you feel better really soon, I know how a clogged nose can be a pita! Thanks for another great challenge! This was a good one for me, I used a tangles that I hadn't before. I would also love to be entered in the give away. I hope you and the family are feeling better. Wow, lots of comments. Glad that you are feeling better. My experience with the virus was not as bad as yours. Hope you and the family continue to get better. I would like to throw my hat in the ring for the give away also. I have also mentioned it in my blog with a links back to your blog. Would love a chance to win a give away calendar a day. Also for an extra entry I'm putting this on my site in Flickr. I had fun with this challenge. I used a drawing I'd abandoned, but could rescue thanks to the dansk pattern. There was still a lot to do and I've no idea what most of the patterns are called. I tend to start drawing one and then go off at a tangent. I sometimes think I've discovered something new, but haven't. Sorry the shading's uneven. I've been trying out a new tool. More on FB. Laura, I am so glad that you and Artoo are beginning to feel better. Thank you so much for the great challenges every week. I would love to be entered to win a calendar, please. I'm about to share this, and I've liked your page. Thanks for the opportunity. So exciting! Yay! i have your offer on my blog!! Thanks so much Laura! Another fun challenge and a great offer to boot! Please sign me up for the calendar give away. I have posted it on my blog as well. You're the best! Here's to a healthy household! May it come to be very soon. Thanks for the website. I have enjoyed reading and viewing the tangles. I just entered my first weekly challenge. I shared your post on my FB as well. Thanks Laura, I really enjoyed dansk, you have created a great calender page and I would be delighted to receive a copy, thanks for the chance to be in the giveaway. Please sign me up fora chance to win the calendar. I was just blogging about how much I'd like one of those calendars. What a great idea for tangling every day. YAY! I got my tile done, and it's still pretty early in the week! Maybe I'll have time to do another. I absolutely love Dansk. Your calendar entries are fabulous. I hope you feel better SOON. Hugs from Tennessee! I am new to Zentangle. Haven't had a class yet. But I enjoy your blog and maybe someday I'll try a challenge. I'd love a chance to win a calendar. What a gift the calendar would be to this newbie! I just started Tangling in December, needless to say it has taken over my life! Sending you some Florida sunshine for your health! I would love to win the calendar! I am new to Zentangle, and am inspired, just looking at pages from the calendar. 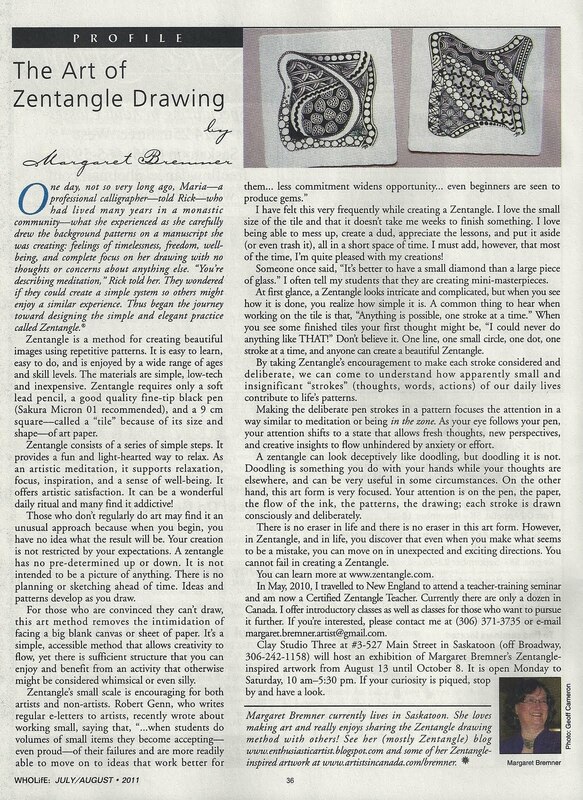 By the way, there was a great article on Zentangle, by Linda Farmer, included in the second issue of "Featuring" magazine, a new mixed media and art journaling magazine published in The Netherlands. Check it out! I'm so glad to hear that you all are feeling somewhat better. Hope your sinus infection goes away soon. I would love to enter your calendar give away. I love Carol's work. Thanks for the challenge and the calendar give away....I would love to have one!! I would love the TAD calendar journal. I think they are a great idea! so sorry your sick and hoping the whole family gets better soon! Sharing this! Four weeks for sinusy-virus stuff? Blech. My son's allergist prescribed a "NeilMed Sinus Rinse," which is the easiest nasal rinse we've tried thus far with my kiddo. Still isn't his favorite thing to use ("feels like accidentally snorting up water while swimming" LOL), but it sure is handy-dee-dandy when trying to get over allergy/sinus yuck. My son is far past the age of wanting to fingerpaint and do crafty things, so I enjoy reading about other moms doing those things with their kiddos -- brings back wonderful memories =). Hope you are able to reschedule Artoo's procedure soon, and that his cough is now gone, or clears up quickly. Thanks for the chance to win! Glad there is a light at the end of the tunnel in terms of illnesses in your family! I want a calendar! Newbie here... 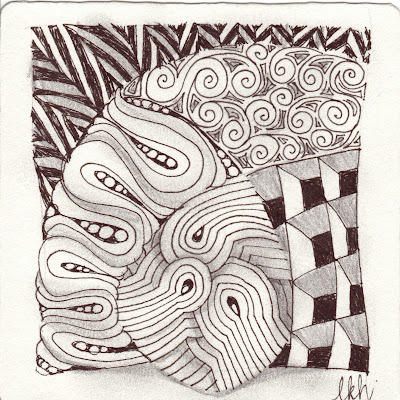 Think I posted my whole picasa album instead of just the challenge zentangle. Sorry! Hi Laura! I'm glad you're feeling better and Artoo is as well! 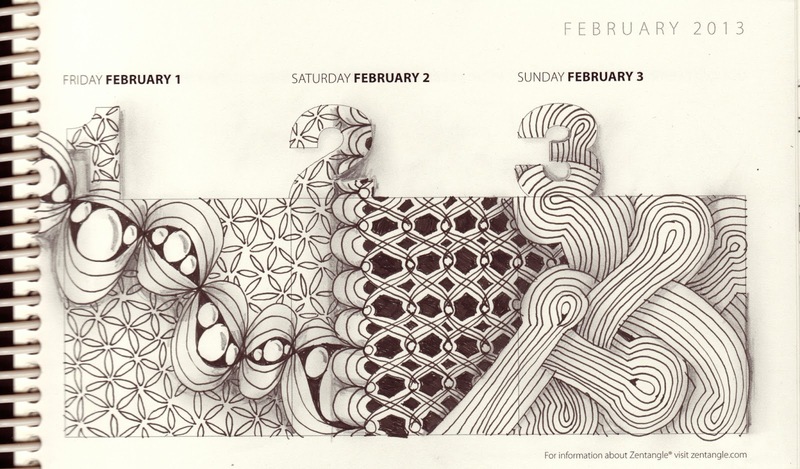 I'm just getting into Zentangle every day and would love to win Carole's Tangle a Day calendar! Thanks for the chance to win! Another Fabulous challenge, I would love a chance to win a 2013 TAD calendar too! I enjoyed this challenge and have added the calendar give-away to my blog. Thanks for everything you do! I do not have my own blog yet so I just pasted a link to my tile, but here is Dianes page. Thank you all for a fun challenge!!! Hope you and your loves are feeling better day by day! I would love to win a calendar. I have also added the giveaway to my blog and liked you on facebook. Thanks so much. I am glad to hear you know what your dealing with and starting to feel better. I hope the rest of your family feels better soon too. Thank you for the opportunity to win Carol OHl's Tangle a Day Calendar, I have added it to my blog site as well. It would be very special prize and an inspiration for daily tangles. Those sinus infections can be a bear! They last such a long time. I would love to have a calendar. 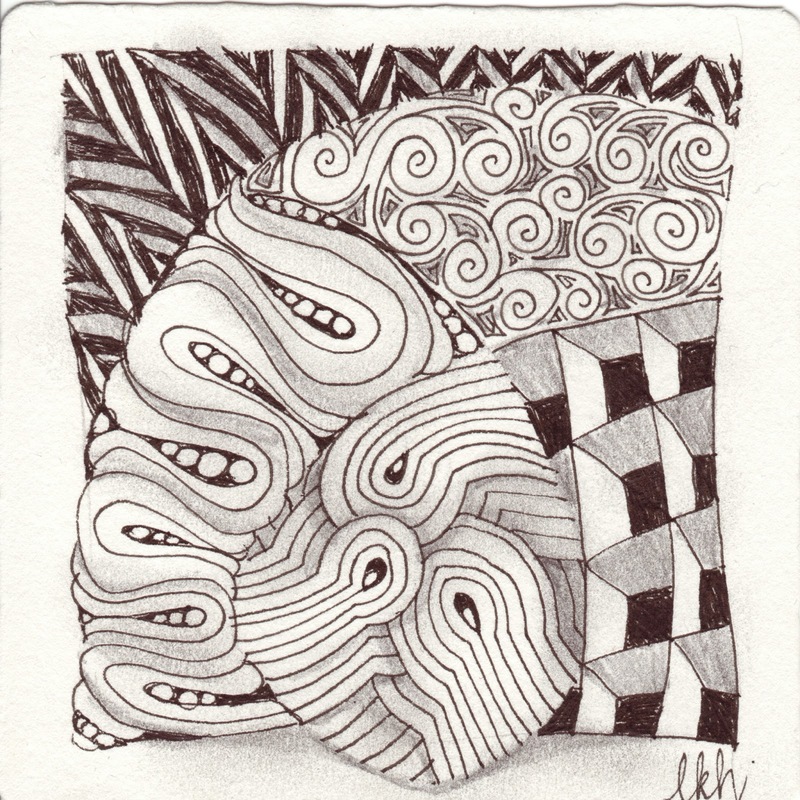 I love the group of tangles you did in your daily Zentangle book. Please enter my name for the giveaway. The calendar looks wonderful. Wishing you a speedy recovery, Laura. Thanks for all the great challenges! Please enter my name in the drawing for the calendar give-away. I hope you and your family will all feel much better soon. I hope I got mine in on time. I have the calendar, I wish everyone luck!! I love mine!! I didn't get a 2nd one done this week, but my daughter completed a Valentine ZIA that includes dansk--before she even knew that dansk was this week's challenge. Serendipity! I really enjoyed this one! MAybe because I thought a little bit more out the box than normal! Oh, Laura, I'm sorry being so enthusiastic: I've entered twice (92+93). I do hope you and your family are feeling much better right now!! not thrilled with my entry, but.... at least i completed it.